When Lt. Col. Henry Waring retired from The Queen's in 1880 he provided a photograph of a cap worn by his Great - Grandfather Averell Daniel who served in the regiment from 1757 to 1770. This cap was presented to the 1st Bn The Queen's in 1927. In 1954 on the amalgamation of our two regiments it was loaned to The National Army Museum. It has now been returned to the regimental museum at Clandon and is now on display. "The front of the cap is of light blue velvet. The embroidery is for the most part silver, but is slightly interspersed with gold. The crown has a good deal of gold on a red velvet ground. The Queen's cypher is of gold on a crimson velvet ground. The motto 'Honi soit qui mal y pense' is worked in gold on a royal blue circle of satin. The mottoes 'Pristin virtutis memor' and 'Nec aspera terrent' and worked in black silk on bands of silver embroidery. The white horse is silver embroidery on crimson velvet. The back of the cap is of crimson velvet with a light blue band, on which is embroidered a gold grenade with the number 2 in silver. The rest of the embroidery on the back is about half gold, half silver. The bob on the top is silver." A somewhat more elaborate headdress than the beret of to-day. The cap was worn by officers of the Grenadier Company of the Regiment. 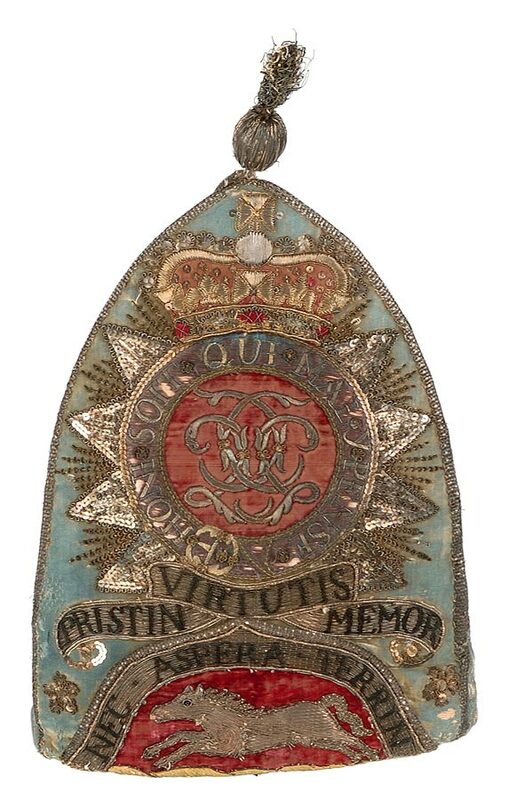 Note the spelling of Pristin, the motto is normally spelt today as Pristinae Virtutis Memor.